I’m working on learning more WordPress infrastructure these days: working with themes and then moving onto modules. Recently I’ve been working on doing prototypes for a secure pdf renderer on a wordpress website. The Dawn Horse Press has an ipad app that we’re considering adding pdf capacity to as well. I was using (GDE) Google Doc Embedder as a free pdf viewer, til they changed their API recently. I have to render the pdf’s in a secure fashion, so no pdf downloading or copying can be done. Also, the “flexpaper” version I’m now working with is beta testing a pdf reflow capacity that I’m lusting after (which is much cheaper than Adobe’s reflow). Dealing with the legacy tools on a server that translate the pdf to web pages via flash, html5, or json is kind of a configuration pain. The Basket of Tolerance “protosite” Website: I did a little design for the website, but mostly I was creating the scaffolding using a lamp stack: an Amazon aws linux instance running an apache web server, mysql and php. 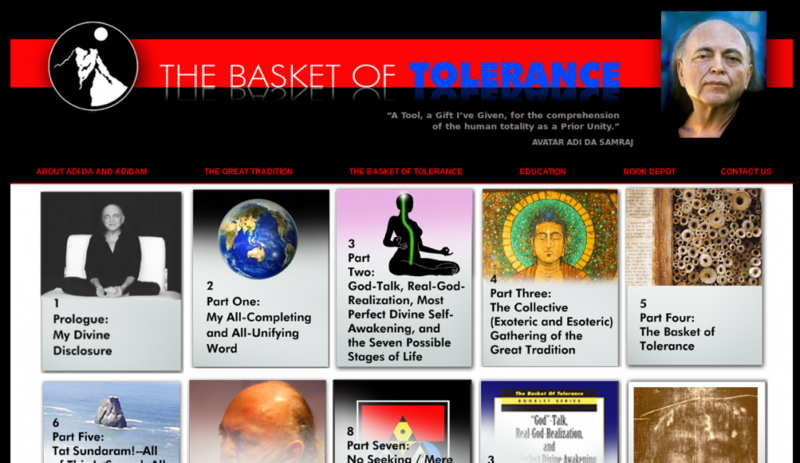 This is a prototype site designed in conjunction with the forthcoming publication of The Basket of Tolerance book. The manuscript for the book, full-length, runs approximately 2,200-2,500 pages. 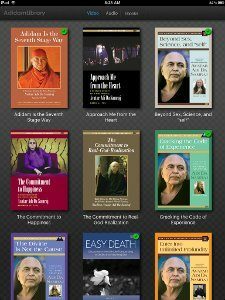 It’s a series of 134 essays and book lists created by Adi Da that demonstrate how the Great Tradition of mankind’s spiritual heritage can be understood as a single tradition of the six stages of life. And how Adi Da’s seventh stage perspective makes sense of all of it via the tools of the stages of life and esoteric anatomy. The Dawn Horse Press has considered ways of making different size editions of it: public version: 250-300 pages (a basic overview); a devotee edition (700-800 pages, more thorough); and the scholar/university edition (the entire version). The website serves to introduce readers to the general concepts of spirituality, Adi Da’s work, and the Great Tradition as a whole. Then it starts to show Adi Da’s ordering of human culture/wisdom via the stages of life and esoteric anatomy models he developed. I’m running the LAMP website on an aws server, and simple html/css/php pages with a small mysql database. I was wanting to write it in drupal, but it was taking too long to learn drupal’s infrastructure, so it ended up being a simple lamp website. 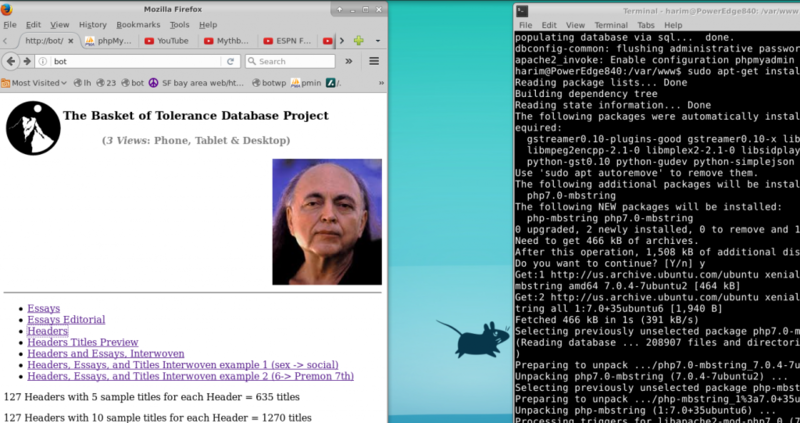 Mysql-PHP database & linux updating a program. Part of the art of the process is turning Adi Da’s book lists into something comprehensible to ordinary people–there’s a small group of book lovers that like pouring over book lists, but for most people it’s like a 500 page telephone book–not something you’d read cover to cover! I was happy to output a text only database list on a webpage of all essays Adi Da wrote in the Basket of Tolerance for instance–but the graphic designer said “No way! It has to be visual.” And she said to make an image for each of the essays, so people can connect to the list. I’ve been working mostly on admin/backend work of an Apple iPad synchronized media project. The “AdidamLibrary” app streams video and audio, and allows for downloading of same. Lots of database work, lots of learning aws server virtual server cloud-stuff admin. Lots of tech hand-holding getting people up to speed on the iPad platform. Also links to the kindle reader for customer’s ebooks. I helped set up an Amazon aws server with a lamp stack. I loaded the mysql database with the audio & video info. After ripping the audio & video, I uploaded them to the AWS s3 directory, which holds the media files, and which are broadcast thru Amazon’s Cloudfront to an ipad app. I also admin the apple server for verification. 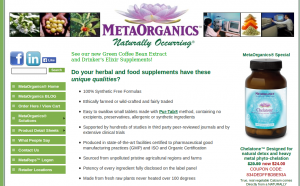 I’ve been maintaining the MetaOrganics.com website for a number of years. Initially it was a number of static html pages, which I converted to php scripts in order to more easily update page footers/headers/navigation elements. 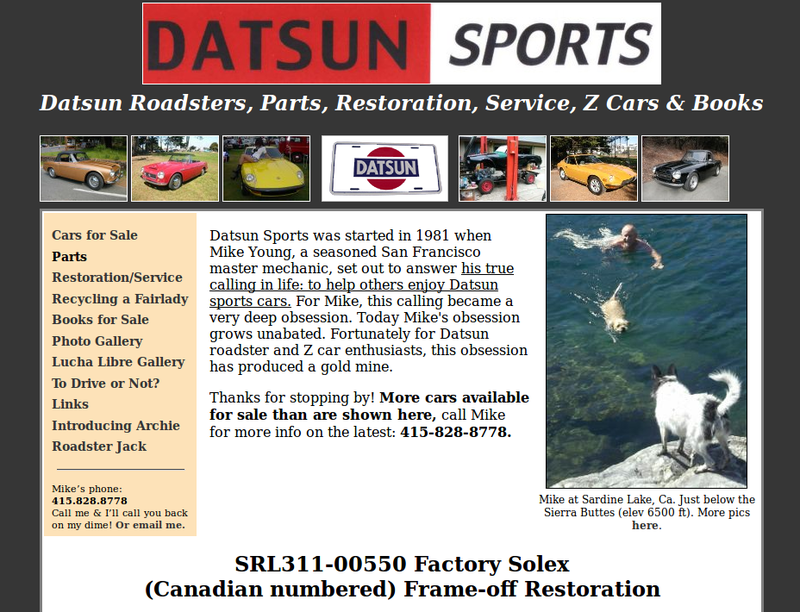 DatsunSports.com: A website I built up from scratch–just some php templates, hosting my neighbor’s Datsun Roadster site. Kinda ugly, I’m in the process of doing a makeover in a responsive wordpress theme.